The wedding celebrations show the controversial mining baron retains influence over elected representatives, whichever party is in power, reports Raghu Krishnan from Bengaluru. Gali Janardhana Reddy got his first iron ore mining licence in 1995. It was around the time his daughter Brahmani was born. 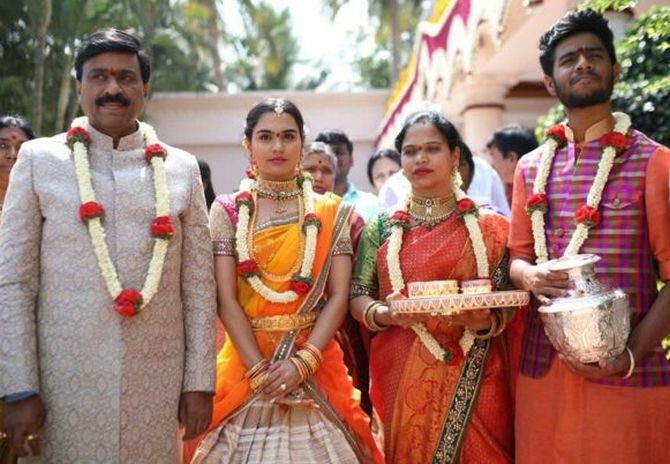 Reddy, whose wealth from iron ore mining helped the Bharatiya Janata Party to form its first government in the south, made sure no expenses were spared for Brahmani's wedding with Rajeev Reddy, a fellow mining magnate's son, last week. The ostentatious wedding that recreated an artificial palace that resembled Hampi, capital of the Vijayanagara empire, and the Balaji temple of Tirupati, is estimated to have cost around Rs 500 crore (Rs 5 billion). The five-day wedding celebration saw 50,000 people turn up, including state BJP leaders B S Yeddyurappa and Jagadish Shettar, both former chief ministers. They defied advice to stay away from the event at a time when the country was bearing the brunt of demonetisation. Not only from the BJP, Reddy saw attendees across the political spectrum. Three top ministers of the Congress government in the state -- Home Minister G Parameshwara, Power Minister D K Shivakumar and Transport Minister Ramalinga Reddy -- and even Karnataka Governor Vajubhai Vala were present. The celebrations also set the stage for Reddy to send a political message that he could not be written off, at a time when the BJP is preparing itself for a comeback in Karnataka. Reddy, a police constable's son, came into prominence during the historic battle between Sonia Gandhi and Sushma Swaraj in 1999 for the Ballari (then Bellary) elections. Reddy and associates campaigned and mobilised resources for Swaraj in a vigorous battle that saw Sonia Gandhi enter Parliament from the traditional Congress constituency. Swaraj and Reddy continued to nurture the seat, which became a BJP stronghold. Reddy's friend, Sriramulu, now represents it in the Lok Sabha. Reddy's closeness to Swaraj got him access to the top leadership. It helped that his mining business was soaring due to China's growing appetite for steel. Reddy not only used his licences but also became greedy enough to tap iron ore illegally, plundering not only the earlier pristine environment of Ballari, but altering the border between Karnataka and Andhra Pradesh. At the same time, he funded the BJP's desperate push to win Karnataka. Joining Yeddyurappa's cabinet as minister, he launched 'Operation Kamala' to buy out legislators to ensure the government' stability. With brute money power, Reddy's writ ran so large that he controlled the transfer of bureaucrats and also how much mining had to be done in Ballari. It did not last too long. After state Lokayukta Santosh Hedge indicted him in July 2011 for illegal mining activities that cost the state exchequer, the Central Bureau of Investigation arrested him for defrauding the state. And Yeddyurappa had to resign after the Lokayukta indicted him of involvement. Since January 2015, Reddy is on conditional bail issued by the Supreme Court, which has told him not to set foot in Ballari, so that he doesn't influence people there. The wedding celebrations show he retains influence over elected representatives, whichever party is in power. In fact, the BJP's desperation to return to power might increase his clout in the state. The Rs 17 crore sari: 'Has it got diamonds on it?" This wedding invitation is really OTT!